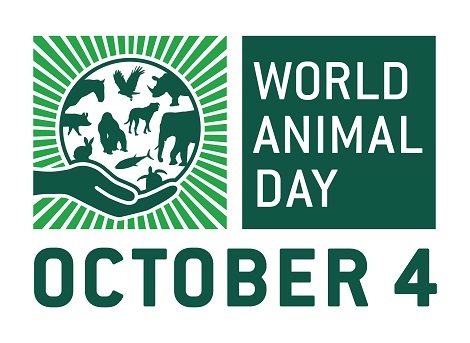 The celebration of this special day unites the animal welfare movement, mobilising it into a global force to raise the status of animals and improve welfare standards. Government departments, city authorities, animal welfare organisations, community groups, youth and children’s clubs, businesses and individuals organise a huge variety of inspiring events that embrace all animals and the unique concerns of each, in every country. It’s something that everyone can join in with regardless of nationality, religion, faith or political ideology. World Animal Day belongs to everyone! Events draw attention to animal issues and makes them front page news around the globe – a vital catalyst for change. Through increased awareness and education, the world will become a fairer place for animals. With the support of over 90 Ambassadors working in more than 70 countries, World Animal Day has already brought about a significant and lasting contribution to advancing animal welfare standards, and its influence will continue to grow. Thanks to World Animal Day and the incredible platform it gives our projects each year, we are slowly but surely raising the status of animals in Asia. Our work continues to help and protect them all and create a world where animals are no longer exploited. The celebration of World Animal Day has already made a big difference to the people and for animals. It’s become one of our annual celebrations nationwide and people are gradually changing the way they think about animals. They are beginning to respect their relationship with animals, the role animals play in their lives and how important it is to their livelihoods to ensure their animals are well cared for. The celebration of World Animal Day creates an important media and public awareness message. A message that powerfully shows animal protection as a global movement and that everyone has the responsibility to care and respect animals. We are delighted that, each year our government and media both love to be a part of this meaningful concept. To set aside a day for celebrating animals means a lot to people here, it tells them that animals are important and have value, and as such should be treated with respect and compassion. Creating an outlook that respects all animals is a slow process and World Animal Day acts as an annual marker to measure progress. World Animal Day is slowly swaying the attitudes of people towards respecting the rights of all animals wherever and in whatever circumstances. World Animal Day has created a loving trend for animals in Lebanon. Every year people look forward eagerly to this day to show how much they care about their own animals as well as animal welfare. It has created a major change in our culture towards animals as well as having a huge impact on raising public awareness about animal issues.